The China Table Tennis Association has chosen Shanghai's Jiading district as the first stop of its open championship set to take place from March 1-3. 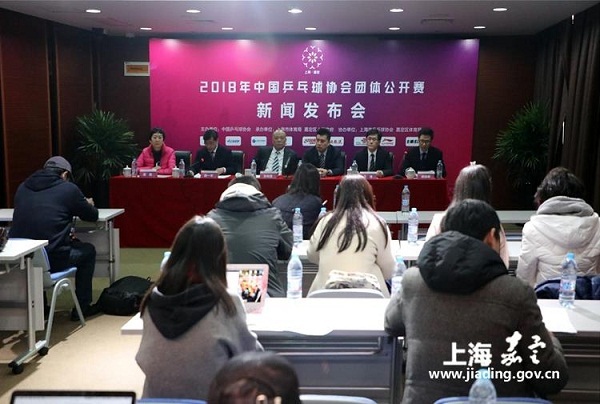 National ping-pong stars such as Xu Xin, Fan Zhendong, Lin Gaoyuan, and Fang Bo will attend the event, the organizing committee announced at a news briefing on Feb 27. "The event will be attended by both professionals and amateur table tennis star players who will team up with other amateur players to compete and exchange techniques," said an official at the Sports Management Center of Table Tennis and Badminton of the General Administration of Sport of China. Eight teams from Shanghai, Sichuan, China's People's Liberation Army, Guangdong, Jiangsu, Shandong, Henan and Beijing will participate in the games. Every team will send a professional male player, a professional female player, one amateur male player aged 30 to 40, and another amateur male player aged 40 to 50 to compete in the games. The games will comprise seven rounds of competition: five singles, one men’s doubles and one mixed doubles. The final champion will be revealed on March 3. Apart from fierce competitions, a variety of entertainment activities will be held on the sidelines. For instance, a ping-pong culture exhibition will be launched at the spectator's entrance. The exhibits include old precious European ping-pong bats, copies of Olympic medals, copies of seven World Championship trophies, and many other items. Star players such as Xu Xin and Fan Zhendong will also visit Jiading Putong Primary School, a ping-pong-feature school, on March 2 to teach local students some basic skills. The event is expected to encourage more people to get involved in table tennis and to draw more attention to China’s sports industry, said the organizers.